A4DM builds and manages PPC, SEM, Facebook and LinkedIn campaigns, including development of content networks. Looking to reach qualified customers directly online? Quality AdWords may do the trick. Investing in Google AdWords can help grow your business online. This type of paid keyword advertising is expense friendly because you can pick the budget that works best for your search engine marketing strategy. When setting up your AdWords budget you can select a daily budget that works best for you-- Google AdWords provides multiple ad formats that you can choose from and customize to satisfy your business goals. AdWords are designed to drive traffic to your website, have people install your new app, visit your location and more. Google AdWords is, by far, the most popular Pay Per Click(PPC) search engine marketing program. Here's how it works: You purchase keywords that are "auctioned" by Google.If a search on Google uses your keywords, the searcher sees your ad and if the searcher clicks on your ad you pay Google. The bad news is, highly competitive keywords such as "insurance," "loans" and "degree" can cost up to $50 dollars per click. The good news? A good PPC campaign strategy can help you choose similar keywords that can yield great results at less cost-A4DM provides PPC campaign management services and can help you select keywords that relate to your industry. Having strong keywords throughout the content of your website, paid ads and AdWords are a valuable asset to your company. Along with customizing your paid Google keywords, you can also select what time of day you want your ads display online, the target audience and A4DM builds and manages PPC, Search Engine Marketing(SEM), Facebook and LinkedIn campaigns, including development of content networks. One of those most effective resources that come along with paid Google AdWords are the reports and analytics. A4DM’s trained professionals can deliver weekly reports that detail the progress of your Good AdWords Campaign and supply you with suggestions for future keywords and tweaks. PPC, SEM or Paid programs can quickly excel and grow your business online.Pay-per-click (PPC) advertising allows you to gain web traffic by buying keywords and phrases that correspond to ads you create. 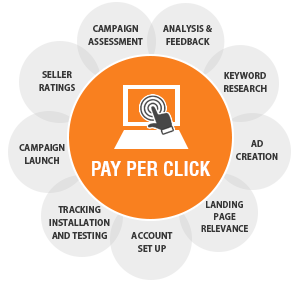 A4DM has an experienced staff solely dedicated to effective PPC campaign management. We continually monitor and improve campaigns to save our clients time and money. And, because of our background in PPC campaign management, we know how to develop better landing pages, which can increase your Pay Per Click (PPC) ranking while, decreasing cost.